The Mastiff temperament is that of a seasoned – but retired – fighter. This description fits because Romans once used the breed as gladiator dogs in arenas, as well as guardians of themselves and their property. Today, owners of the English Mastiff consider him to be one of the best companion animals of all the dog breeds out there. With intense affection and great patience, the English Mastiff temperament is the epitome of man’s best friend. Many families with Mastiffs can attest to the fact that they trust their pets with their children, even the younger ones. There is a unique bond that forms easily between children and their Mastiffs, and it is this bond that makes them best friends for life. A Mastiff never fails to live up to his reputation as a gentle giant. Mastiffs can grow to be as big as 200 lbs., and it takes most between three and four years to reach their maximum physical growth. But don't be intimidated by their size. For a dog who grows to be as large and powerful as a Mastiff, these dogs are surprisingly calm and good-natured. The calm English Mastiff temperament makes him one of the most diplomatic of all the dog breeds. He is very tolerant of other pets in the home, so there is no need to worry about aggression. However, never forget that when a Mastiff feels he needs to defend himself, he will use his brute strength to his advantage to scare off a potential opponent. 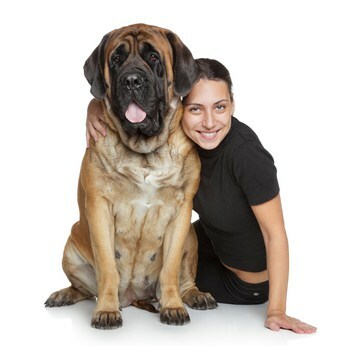 The English Mastiff's affectionate temperament is rooted in the fact that your pet lives to please his you. He recognizes you as his alpha leader, and it is this attitude that actually makes the Mastiff very easy to train. The Mastiff is an alert dog, and he certainly lets you know it. Although Mastiffs are not ”yappy,” they can certainly become bothersome when they bark. This is because his bark is a booming one, sure to scare away an intruder but will also annoy the hell out of your neighbors if he keeps it up. Thus, you have to train your Mastiff to obey your command to stop barking unless absolutely necessary. Because of the Mastiff’s size, early socialization and obedience training are musts for this breed. He’s a big guy, so you definitely don’t want him jumping up on people or pulling on his leash as an adult. It might be cute while he’s still a puppy, but for an adult dog who is 28 to 36 inches tall, and weighing between 120 and 230 lbs.? Not so much. If you have trouble training him, hire someone who can – it’s that important. Socializing is the key to developing your Mastiff’s temperament. Exposing your pet to all kinds of people, as well as dogs and other pets, will make him a more effective protector. This is because the Mastiff will be able to interpret different types of body language and differentiate a friendly presence from a hostile one. Positive reinforcement can work wonders when training your pet. Pour lavish praise on him and give him lots of belly rubs and pats on the head. Your pet’s favorite treats will also produce favorable results in the shortest possible time but take care not to go overboard. The last thing you need is for your dog to suffer health problems associated with being overweight. Just be sure to vary up your training. The Mastiff gets easily bored, so it’s nothing out of the ordinary for him to curl up and take a nap if he’s fed up with your methods. Mastiffs are also especially skilled at reading your body language and expressions. You can break his spirit if you’re too harsh with him, so focus more on pointing out the positives over the negatives. Just like any other breed, a Mastiff needs to know his order in the pack. Training him tells him indirectly that you are his pack leader. Mastiffs respond well to human leadership. As the alpha dog, you need to exercise consistency and proper leadership, and your Mastiff will learn what your rules are and how to follow them. For help with training your Engish Mastiff dog take a look at The Online Dog Trainer by Doggy Dan. Doggy Dan is an expert Dog Trainer based in New Zealand. His online resource contains Hundreds of Excellent Dog Training Videos that will take you step-by-step through the process of developing a healthy, happy well-behaved dog. Because of his larger size, the Mastiff is prone to health problems. Instability can lead to sprained ligaments, stretched tendons, and even patellar luxation and dislocation of hip joints or elbow joints. These conditions can all lead to mobility problems, inflammation and pain. The average lifespan for a Mastiff is between 10 and 12 years. That’s pretty good for a dog his size. Usually dogs of this size, like the Saint Bernad, live between 8 and 10 years. Before bringing a Mastiff home, be sure of your intentions and ask yourself if you are ready to own a powerful dog that will someday outweigh you. If you’re just going to tie him up in your backyard all day, don’t bother getting a Mastiff. He is a pack dog, and he wants to be with his pack. Leaving him alone outside for long periods can lead to him becoming bored, sad, or lonely, and it increases the possibility that he will develop destructive traits like chewing. After all, would you want to be outside all day with no companionship? You could understand how the Mastiff would feel in a similar situation. After all, it’s not his property or territory that the Mastiff feels the need to protect; it’s the members of his pack. Grooming a Mastiff is relatively easy, with only a quick brushing required every few days. He has a shedding season once or twice a year, so you will need to brush him more regularly to remove the dead hair. You also need to regularly inspect his ears and the wrinkles around his head, eyes, and muzzle to keep them free of dirt and debris, else they could become infected. Something else important to note about the Mastiff: he drools. Keep a cloth handy to wipe his face down – and your own clothes! Standard colors for the Mastiff include brindle, fawn, and apricot. Despite being huge dogs, Mastiffs don’t require a lot of exercise. This actually makes them – believe it or not – good dogs for apartment living. This is one of those breeds that you have to be very careful with as puppies because too much exercise can damage their still-growing bodies. Don’t allow your Mastiff puppy to run up and down the stairs or jump from a height. And don’t take him for walks that are too long. A half a block is perfect for a 2 to 3-month-old puppy. Adult Mastiffs, however, do best with daily walks lasting about a mile or two, as well as free play in the yard or dog park. The rule with Mastiffs is, don’t walk them any further than you can carry them back home. This is because a tired Mastiff has no problem laying down in the middle of a walk if he’s too tired to continue. If there is a dog breed out there, someone will find a way to mix it with another breed and come up with a clever name for that mix. The good thing is that, if you are open to mixed breeds, you have a better shot at adopting a dog sooner, rather than later. So you've decided that you'd like to add a Mastiff puppy to your family. Congratulations! You can find a Mastiff for sale either from a breeder or through a rescue or adoption agency. The price of a Mastiff sale varies, depending on which route you choose to go through. Mastiffs are pricey dogs. The average Mastiff price can run you between $1,800 and $2,500. The price of the dog depends on a lot of factors, including where the breeder lives, what the breeders decides to charge, and how “pure” the dog’s parents are. The price for adopting a Mastiff puppy, however, is about $300 on average to cover the expenses associated with getting his shots and neutering. If you want to adopt a Mastiff puppy, you can find one through your local rescue organization. Adopting a Mastiff not only saves you money, but it also saves one more dog from having to spend what could be his entire life in the pound. If you’re open to a mixed breed, then you may be able to find a Mastiff sooner, if one is not readily available for adoption. And when you adopt, you are getting a dog that already has training, so you don’t have to worry about housebreaking him or training him not to chew. If you’re considering buying a Mastiff puppy from a breeder, be sure to make a list of possible names, and then vet those names on the internet. Chances are, if someone’s had a bad experience, there’s a review out there detailing it to save others from encountering a similar situation with that breeder in the future. Inspect the breeder’s premises to make sure it’s not dirty, and that the dogs are not living on top of each other. Make sure you get all the dog’s necessary paperwork, including health certificates. The last thing you want to do is pay thousands of dollars for a sick dog. The English Mastiff temperament is surprising because for such a big dog, he’s actually just an affectionate ol’ lug. He loves his family, and he lives to protect them. He also respects you as his alpha, so long as you train him properly. Grooming and exercise are no big deal for the Mastiff. Take him out for daily walks but be careful not to over-exercise him while he’s a baby. And groom him regularly but step it up a bit during shedding season. The most important things to pay attention to are keeping his folds clean and free from infection, as well as drying him off from his constant drooling.